Slorgs. Oh yes, we return once again to the topic of those ever smiling, ever cheerful, slime machines. Now they might not be the most practical of petpets to take care of (the cleaning, the house, and not to mention the smell) but they are absolutely brilliant in my opinion. Have you ever tried prodding a Slorg? They don't get annoyed. Seriously. They are the ultimate buddy; you may know that you look slightly chubby in that new dress or you may be having a bad hair day, but they squeak and smile nevertheless, and who can resist a smile like that? Sure, I know that they go rampaging in the the fields of Meridell, causing endless famines and admitting more fainting incidents into the Neopian Hospital than any other creature on Neopia (with the exception of Jhudora; you don't want to get on her bad side, especially if it concerns Illusen), but think of it this way. No one likes eating vegetables anyway, so what's wrong with sacrificing it all to the Slorg? I'm pretty willing. So if you want a Slorg friend for life, carry on reading. 1 - Never buy blue crayons. Seriously, don't. You see the Slorg on the front page of the Neopian Times? He's holding a RED crayon with a look on his face that is suggestive of the desire to play the game 'fetch'. The significance of this? He's doing the same thing on every single NT cover; that means 1, he is the Slorg leader who has bribed and/or scared TNT into advertising himself and the drawing material every Friday (which in turn means that he is scarier than a Meepit and should not be meddled with) and 2, the Slorg leader likes red crayons so all Slorg minions must follow and have this love! Therefore, if we start waving blue crayons in their faces, they will start crying and we don't want that if we're trying to become buddies. 2 - Don't buy the Neopian Times on festival days. Why? Because those are the only days on which the probability of seeing a Slorg on the NT is reduced to practically 0 (I say practically 0 because you never know, maybe they've invented a super human robot who writes convincing articles about Slorgs that TNT like and suddenly appear on page four of the NT). This is because on the default template of the NT, there is always a slorg in the background! Seriously, look carefully on the left; it may be white washed but it's still there! How do Slorgs have the amazing ability of popping up absolutely everywhere? I mean, hello, have you seen that petpet personality quiz thingamajig (where's it gone recently? ); has anyone got anything else aside from a pink Slorg? How did they take over that? And why, as a matter of fact. o.O I'll tell you why; it's BRAIN WASHING. Well, not really, but they're trying to get noticed because we do often get rather annoyed at Slorgs, don't we, because they cover absolutely everything in slime and that's not good if the pets have homework due the next day at Neoschool. Aside from that, it's a great way to cure vanity, especially with Unis (what's the plural of Uni? Unii, Unis? ), because slime + Uni = scary tantrum + kick + sore back side. Well, usually anyway; if we hypnotise them into thinking they are Slorgs, we will remove that problem, won't we? 3 - Worship the Asparagus. I have reason to believe that it's Adam's doing that Slorgs appeared on Neopia in the first place and have grown to such huge numbers since. For you see, whatever petpet they previously evolved from, food for them must have become in short supply and thus they were attracted by the distinct scent of the Asparagus. Therefore, they defied the laws of evolution and somehow rapidly mutated into a new Asparagus munching species in order to feed on the Unofficial Neopian Vegetable Mascot. And in turn they then discovered all the scrumptious vegetables on our planet and decided to mutate again in order to adapt to the rich supply of food. Anyway, I can conclude that worshipping what Slorgs worship as the creator of their species is a certain to get into their good books. 4 - Do not zap them mutant. Why? Look at the petpet colors page at the Rainbow Pool. Every single one of them is smiling! Even the Darigan slorg's lips are pulled up! And yes, I can see that the Grey one isn't smiling, but come on, that's just for promotional purposes. I bet after that photo shoot it started giggling and being happy again. But now look carefully at the Mutant Slorg; can you see how shrivelled it looks? Surely it's having problems smiling with such taut skin, and what do Slorgs love the most (after eating all of our fields, of course)? BEING HAPPY! 8DD So, if you zap them Mutant, they are going to have a difficult time trying to smile 24/7 and even the most cheerful petpet's going to get annoyed after trying for so long, right? So don't do it. 5 - Stay away from the Cooking Pot. We all know that the Cooking Pot is famous for making all sorts of weird and wonderful creations, but accidentally drop a Meowclops and a Slorg in it and you're going to end up with something that falls in the weird category. Why? Because out will pop a half furry, half slimy Slorgclops, which isn't the most intelligent of combinations if you ask me. Slime on its own is already bad enough, but slime and fur? 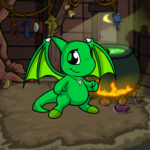 First of all, how on Neopia is that attractive? Secondly, cleaning is not going to be easy for you or your Slorgclops. And finally, a Slorgclops, although half Slorg, is not a Slorg and at the end of the day it's a Slorg, not a Slorgclops, you're trying to impress to stick with it! 6 - Hug a Chia Clown. I don't know about you but I am TERRIFIED of Chia Clowns, and clowns in general, as a matter of fact. Do you not find their weird smiles and glaring eye make up scary? Well, I do. -sniff- But honestly, the best way to make friends with a Slorg is to, well, make friends with their friends. Slorgs originated from the Haunted Woods, so I suppose it makes the most sense to create some peace with its residents. And as weird as it sounds, yes, even the spookiest Neopians have friends, so if Edna calls you one day or the Tale of Woe decides to re-emerge, stop and take the opportunity to hug a Chia Clown. Oh, and be careful of the nose; I've heard that it's the self destruct button. So there we have it; the six best ways to impress a Slorg. Not the most cuddly or most handsome of petpets, but definitely the best. So what are you waiting for? Go hug a Chia Clown.